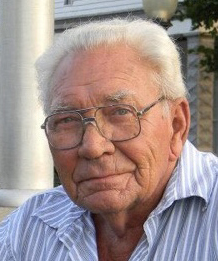 Carl Gene Lee, 86, of Lewisport, passed away on April 4, 2019 at his home under the care of Hospice of Western Kentucky. He was born on July 15, 1932 in Depoy, Ky to the late Jesse and Dovie Crittenden Lee. Carl was a member of Lewisport Baptist Church and was a retired electrician at Commonwealth Aluminum. He was a Korean War veteran, serving his country in the United States Navy. Carl enjoyed fishing, woodworking and shooting pool. He was preceded in death by his sisters, Dorothy Randolph, Mary Belle Flynn and Margaret Randolph. He is survived by his wife of 61years, Barbara Lee; daughters, Wanda (Jeff) Ballard and Denise (Chris) Buening; son, Byron Lee; grandchildren, Logan Ballard, MaKayla Wallace, Quinn Ballard, Paige Wallace and Emma Buening; great grandchild, Bryar Wallace along with several nieces and nephews. Services will be held at 11 am on Monday April 8, 2019 at Gibson & Son Funeral Home, Lewisport with burial following in Lewisport Cemetery. Friends may visit from 4 pm until 7 pm on Sunday and from 9 am until service time Monday at the funeral home. Memorial contributions may be made to Lewisport Baptist Church or Hospice of Western Kentucky.